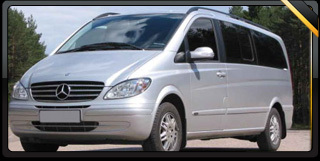 In our opinion, no other vehicle in its class offers as much comfort as the mercedes Viano. With a flexible seat arrangement, it is possible to offer armchair comfort for up to 5 passengers (one in the front) or a larger people mover with up to 7 passengers. We operate only the top of the range Ambiente model. Please note however, that with the maximum number of passengers, luggage space is virtually non-existent. Available in black and silver. 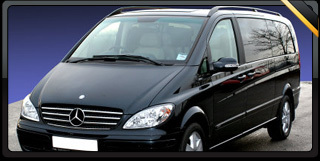 The Mercedes Viano is offered in the top of the range, Ambiente models, which are available in silver or black. Specifications vary, some may be fitted with a rear passenger entertainment system consisting of DVD player and televisions. Seating configurations vary. 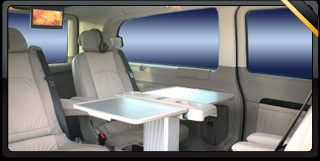 Typically the Viano is suited to carrying 5 passengers in 'armchair style' comfort, with 4 in the rear and one in front. 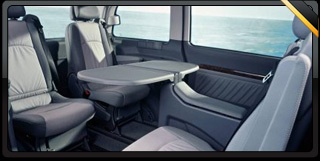 A further two passengers can be accommodated by the addition o a bench seat in the rear. Please note, depending on the seating configuration, luggage space can be reduced to virtually nothing, please ensure you let us know your requirements before booking.